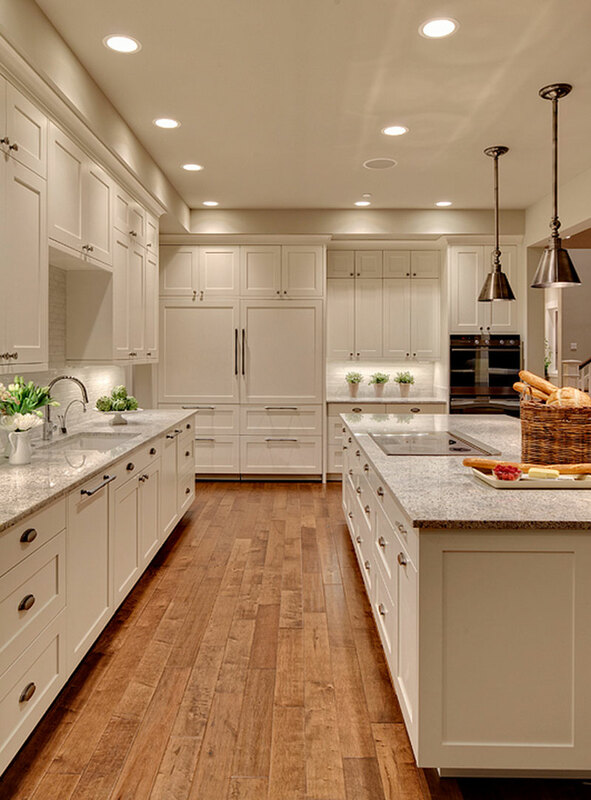 If you’re someone that happens to love his home – even if it isn’t finished yet – and are facing the challenge of choosing kitchen counters and finishes, this article about white granite countertops is for you. Maybe, you have your heart set on Italian Carrera Marble because the whiteness of the marble seems to reach deep beneath the stone’s silky smooth surface. You like the coolness of natural stone to the touch. So, you do some research – thank heavens for the Internet – and discover that marbles have a nasty habit of staining easily. And, that’s just for starters. 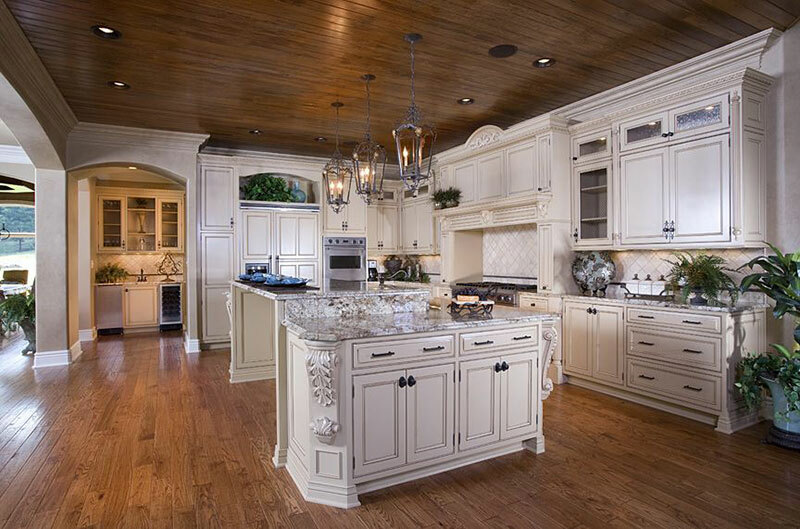 As you think it through—the reality of installing Carrera Marble as a countertop in your kitchen (or anywhere else for that matter)– you admit to yourself that you aren’t the neatest cook in the cookie box and your friends and family are not obsessed with cleaning up spills on game night. Additionally, you’re not thrilled with the idea that you’ll have to pamper this beautiful translucent stone, bathe it, avoid citrus juices or vinegars from touching its surface and reseal it every 6 months to a year. Well, you’ll be happy to know that there is an alternative. The island in the picture below is White Princess Granite: it is one of the great white granite substitutes for marble. What is granite? Granite is a natural stone that is quarried in many countries around the globe. Granite and Quartzite are the names that are used interchangeably wherever stone tile and slabs are sold. True Granite is a porous, igneous rock that has any number of chemical compositions that include a quartz base. Quartzite is a metamorphic rock that has a higher percentage of quartz in its chemical makeup than granite does. For the record, true quartzite is harder than true granite. But, don’t get too caught up in the name of the stone because regardless of which it is, geologically speaking, it has the same purpose and durability. Below is Princess White, which is a quartzite but is often referred to as granite. If you compare the picture at the top with the photo below, it’s very difficult to tell the difference. 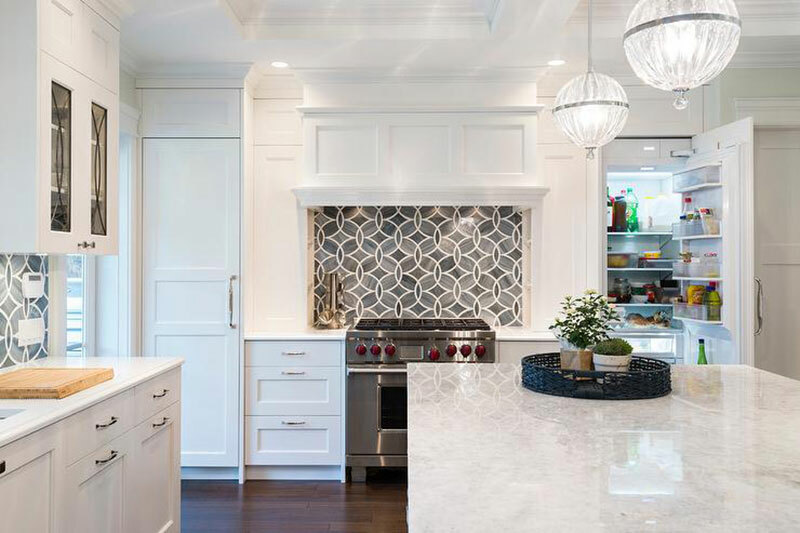 Princess White, which is also known by the name White Fantasy, is also the best color if you want to mimic marble in your kitchen or bathroom. White Granite is harder to find than black or brown granite. All granite (and Marble) gets its name from the background color. Some white granite slabs have veins similar to marble while others may have a spattering of freckles in either brown, gray, black or red and may include a sprinkling of blue throughout. This is the Artic White flecked with a darker brown and mottled with bluish color. This is White Ice granite. The veining is closer together and less defined than the veins in marble tend to be. This is Fantastic White Marble with the same type of coloring and pattern as the White Ice granite. The point is simple: Granites can easily take the place of a variety of marbles, which are extremely fragile for everyday living. 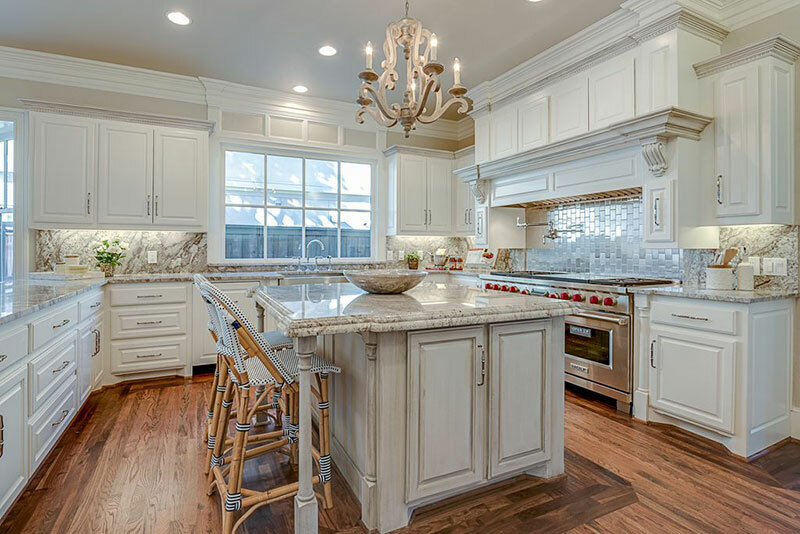 The following are the top white granite colors for kitchen countertops and backsplashes. River White Granite is also known as Valley White and comes from India mines. The background is a translucent white with gray, blue and taupe veins and burgundy patches running throughout. The pattern is more linear than some granites, thus the reference to rivers. Unlike many granites, you can find it in slabs over 8’ x 8’. This makes it ideal for use on large islands without worrying about seaming. The slabs are polished before shipment and an epoxy is used to fill in any cracks or natural pits that would interfere with the smoothness of the surface. White Ice Granite is mined in Brazil and quantities end up being quite limited which accounts for the higher price on this stone. 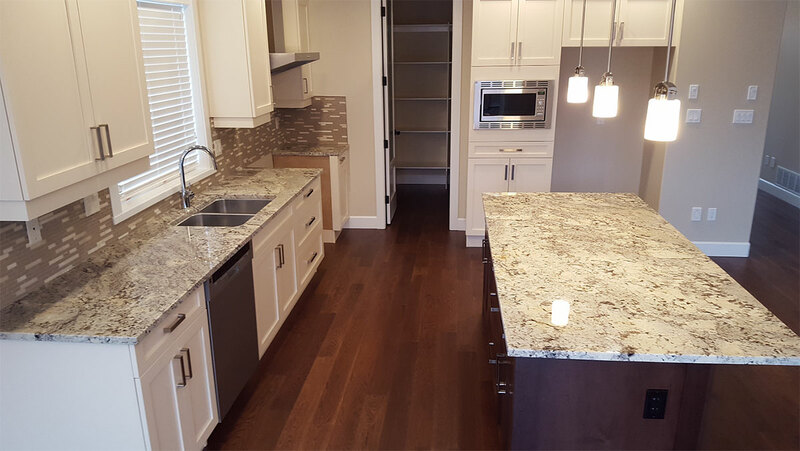 White Ice made its name in the granite countertop field because of its snowy white background and the contrast of the dark veins and patches. This one also has some blue veining in it and slabs are usually 8’ x 8’in size with the occasional slab larger than that. White Ice is cut to 3 cm thick, making it one of the nicer slab products for granite. 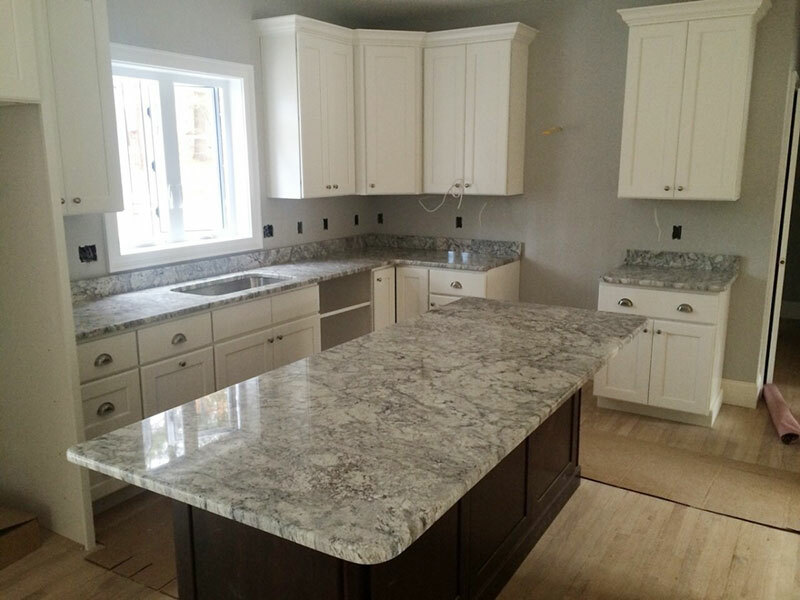 Colonial white granite is known for its consistent veining with grays, blues and taupe highlighted in the stone. It is quarried from Café Crème – one of the deepest mines in India and able to produce extremely large slabs averaging 12’ x 12’. This is one of the granites that are cut in a bookmarked fashion where slab one and two mirror each other. Super White Granite is not granite at all. It’s actually a quartzite, which is harder than granite and has equal or better durability. Some suppliers actually list it as marble, so check for a supplier that charges a granite price and save money. And, to add to the confusion, it is also called Fantasy White in some areas and White Vermont in the Northeast. The slab designs could be described as looking from a plane down into the Arctic Ocean. The veining is various shades of gray from very light to very deep with a hint of undertones of blue. Kashmir White Granite is found in the same areas where Garnets are found in Southern India. As a result, it sometimes has small inclusions of garnets embedded in the slab. The patterns of greys and black mica give an overall salt and pepper appearance with swaths of veining running across it. 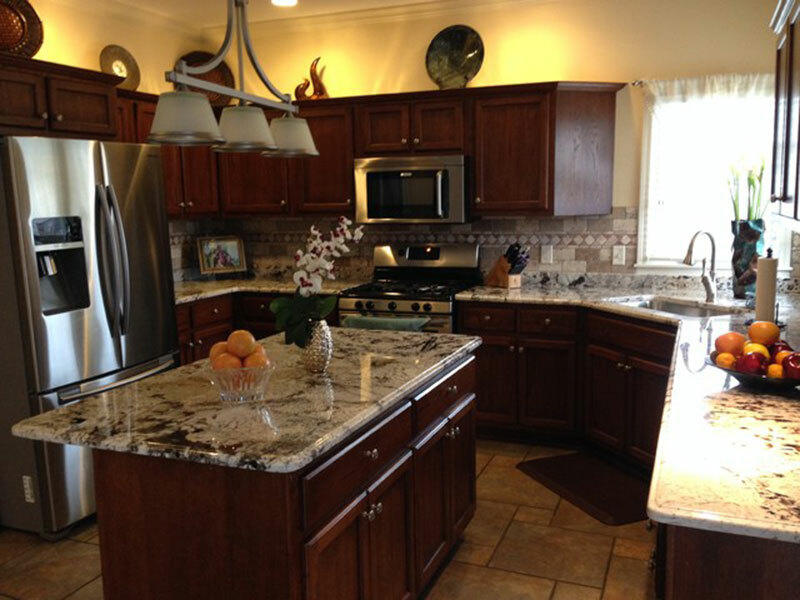 Unfortunately, this beautiful and very popular granite has some major drawbacks when used for kitchen countertops. It is extremely porous and therefore, stains too easily. Worse yet, the best sealant does not help prevent it from staining. It also means that it needs cleaning with granite cleaner at least every other day instead of weekly. 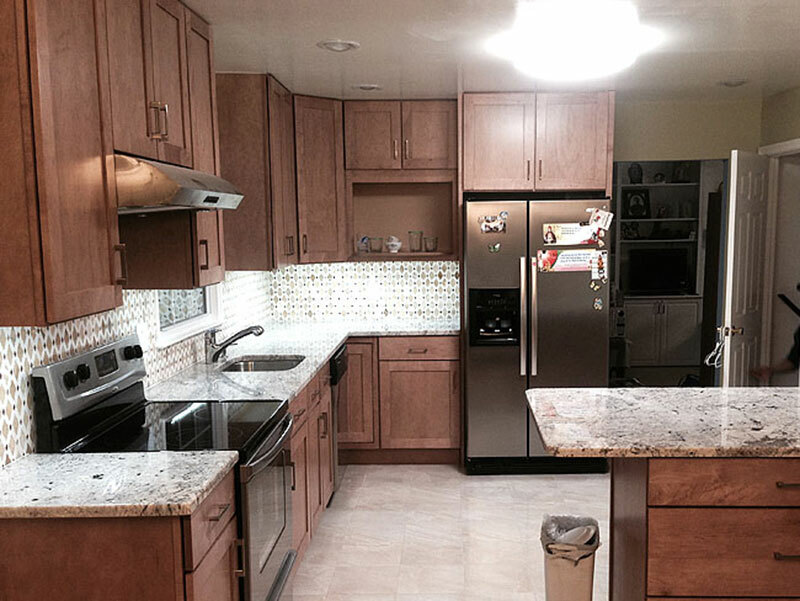 Alaska White Granite from Brazil is a beautiful blend of palest silver and frosty whites highlighted with neutrals and onyx hues that glitter with a warm glow in sunlight and under kitchen lighting. Because it comes in a fairly large range of slab sizes, it is an ideal choice for any application in the kitchen. This is another granite that is bookmarked during the cutting process, which allows for matching the flow patterns for seaming or for consistency in other areas of the kitchen. It works especially well with gray, black, white and dark brown cabinet tones. 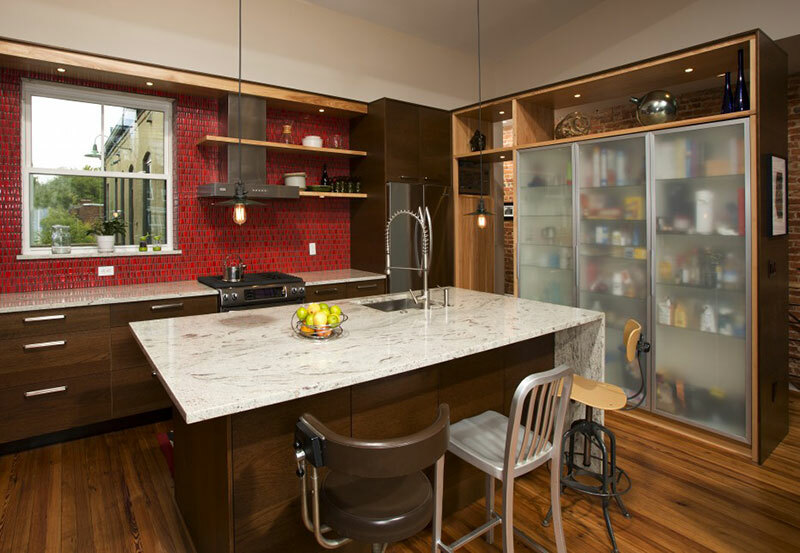 You might consider a glass tile backsplash if you want to add drama or color. The patterns in this granite are reminiscent of a forest floor in winter; it varies from smaller veining to larger patterned colors. Brazil-mined White Spring Granite is one of the all-time classic white granites in use in kitchens around the world. One of its trademarked characteristics is the reddish tones of the veining that ramble their way through the snow white to dark white backdrop. 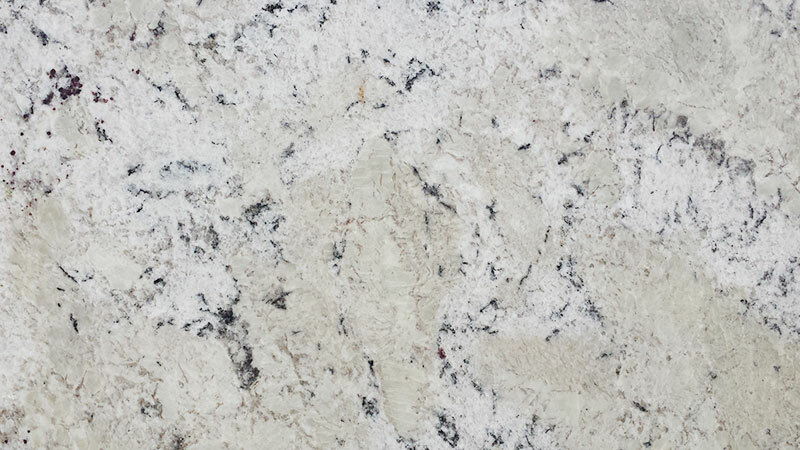 This is a close-up view of White Spring Granite from southern Brazil with a dark white background while the photo below has a snowy white background. It’s the red pigment that makes this granite so perfect as a contrast to cherry or mahogany cabinets. Moon White Granite comes from a mine in India where rust and taupe colors predominate due to oxidation over millions of years. The slab colors are consistent year after year which makes this ideal for doing one countertop at a time if the budget demands it. Rarely, if ever, does this granite have black spots. 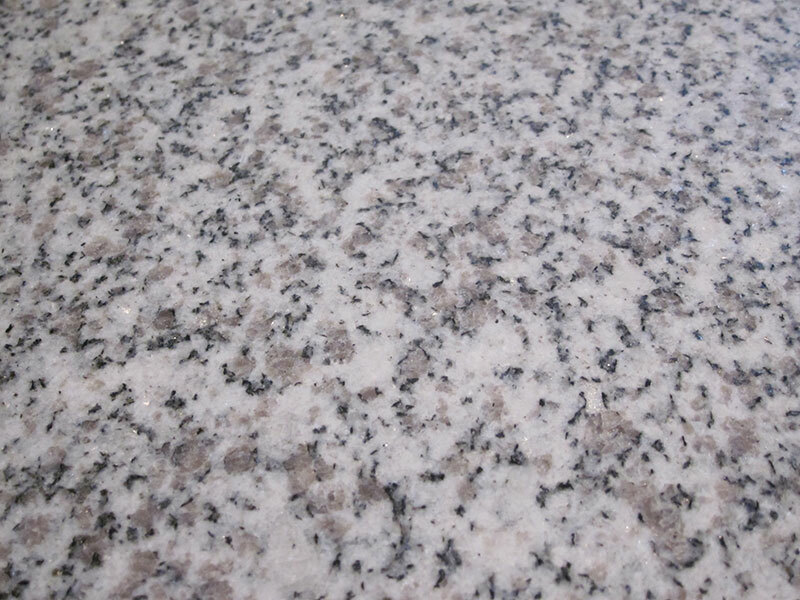 White Galaxy Granite is one of the granites mined in China. The striking blue, gray swirls and dark blue specks that occur in this granite is the key to its personality. Aspen White Granite is quarried in Namibia, South Africa and processed in Italy since there are few factories and craftsman in the area of the mine. Even though this is a new mine, there are huge slabs already coming out but the veining and mottling will vary from block to block so buy all you need at one time. 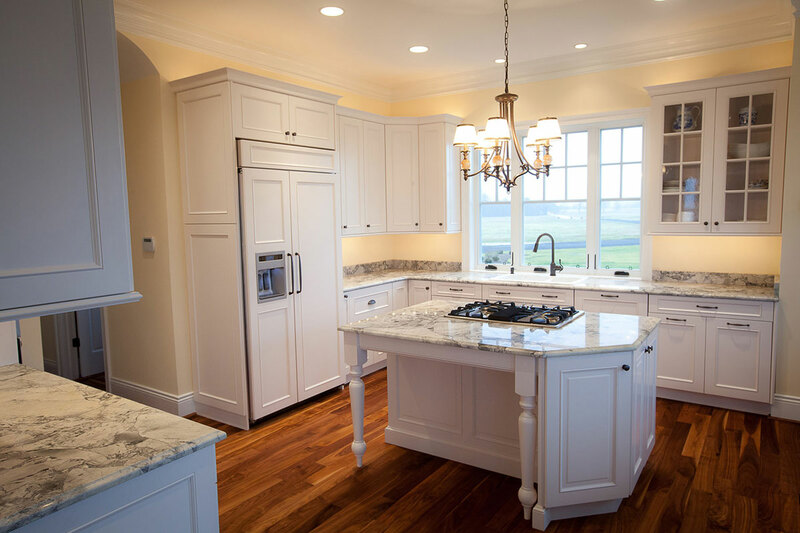 White Fantasy (see Super White) granite is one of the best for a marble-like finish. Delicatus White Granite is found only in Brazil and as is typical of Brazilian white granites, the background is clear rather than muddled as some are prone to be. Delicatus sports black embedded crystals to give it the sparkle that many homeowners prefer. Glacier White Granite is a China granite that has a translucent white background with gray striations in various shades throughout it. 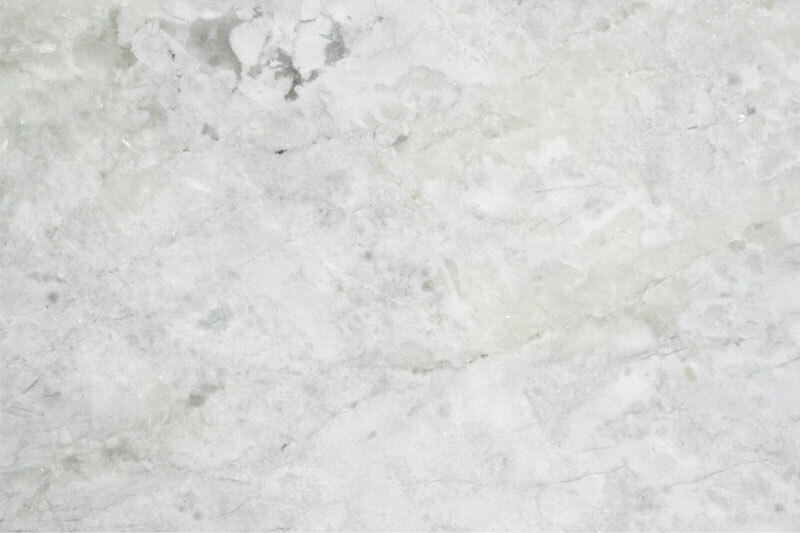 Not all Glacier White slabs are marble-like – some are mottled and speckled with a more traditional granite appearance. Thunder White Granite is an unusual stone from Brazil as it is known for its close-knit pattern in grays and dark red tones, giving the stone the feel of a thunder storm rumbling in the distance. 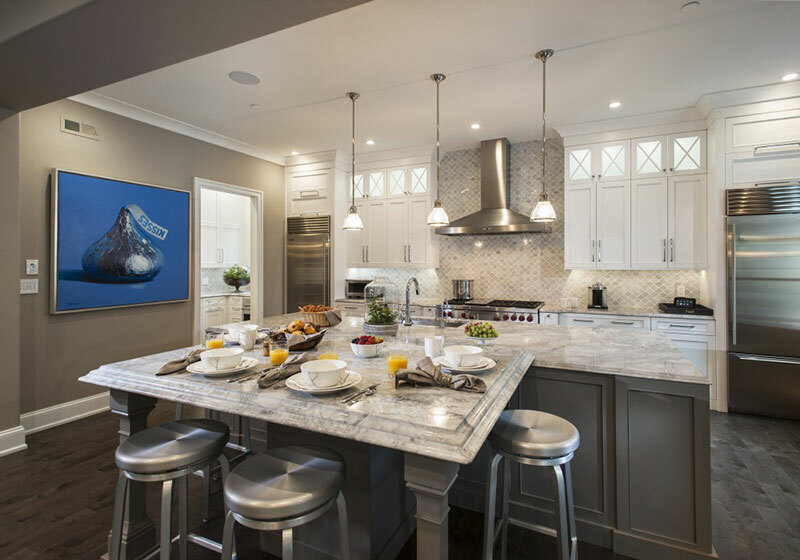 The kitchen below courtesy of Kitchen Capital uses the same granite slabs as the backsplash. 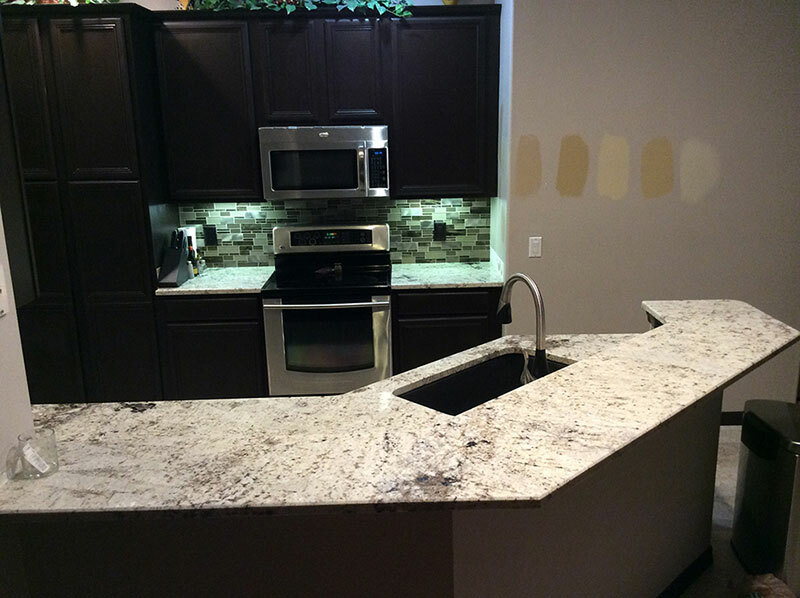 One of the largest benefits of this granite choice is that it can be finished in more ways than any other granite. Alpine White Granite is yet another of the Brazilian granites but this one has hints of turquoise and occasionally turquoise chips will be found embedded in the slab and is a bookmarked during cutting. Additionally, this is one of the few stone slabs where the factory adds a mesh backing to prevent damage during transport. 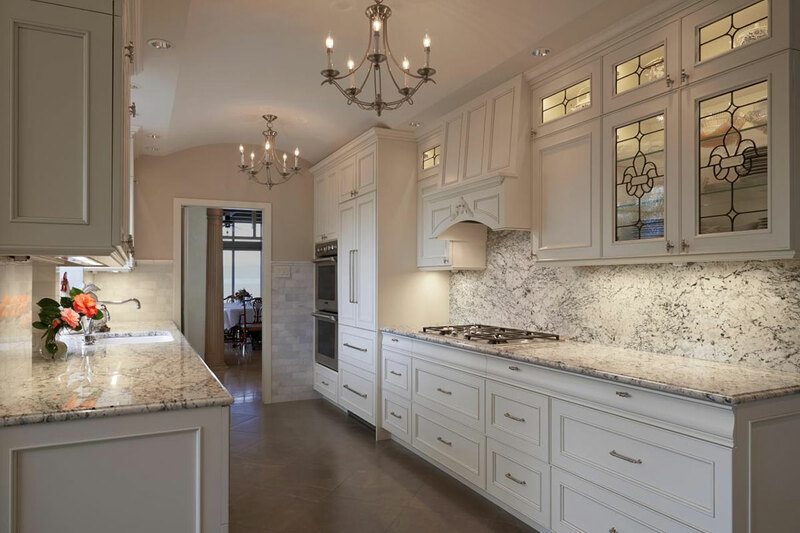 Arctic White Granite is imported from the mines in Finland and has one of the most naturally reflective surfaces of any granite around– not to mention that it is one of the only white granites that have few colored pigmentations. It’s as close to being a fallen snow granite as one would desire. It is excellent for fireplace surrounds as well. 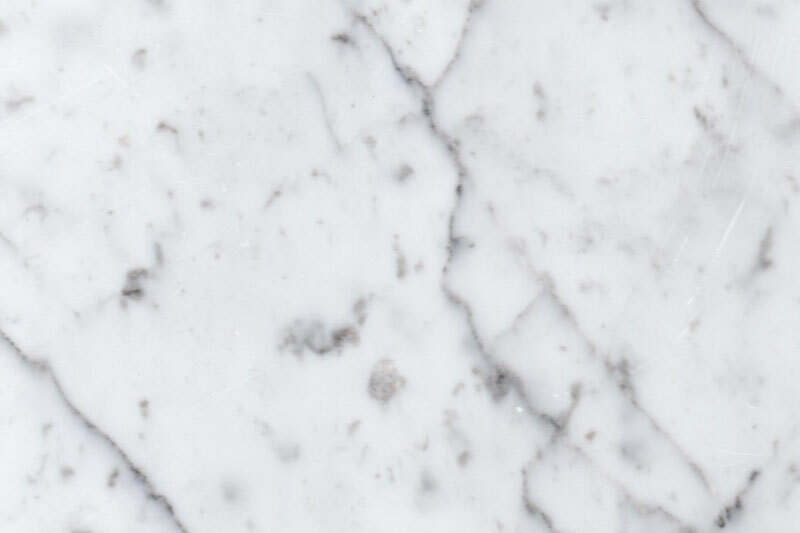 White Pearl Granite is found in two nations in the world: Saudi Arabia and the United States. The coloring in the slabs from Saudi Arabia is grayer and from the U.S. more taupe-pink in shades IF any pigmentation is seen at all. The background is the color of the inside of the oyster shell where pearls are formed. 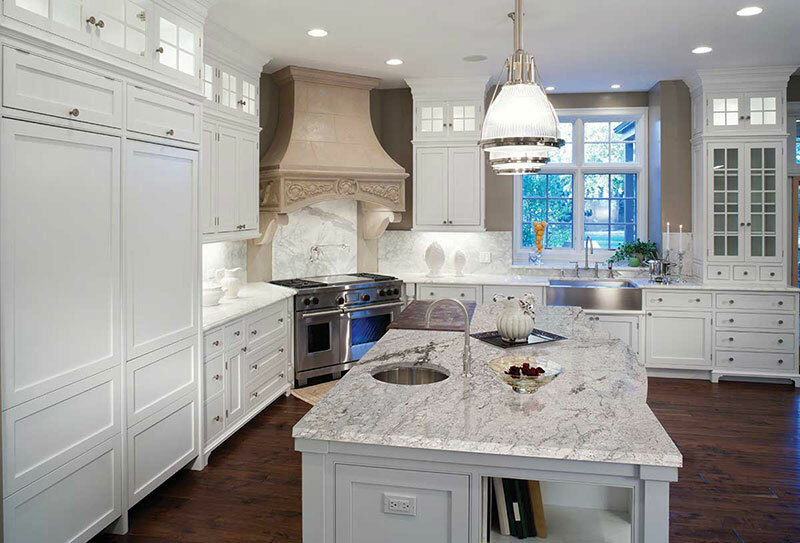 Princess White Granite is one of the other most popular versions of granite that mimics Carrera marble. Coming out of the South African mines in Namibia the whirls form eddies that pool into various areas of the surface. The colors are predominantly grays and whites with soft Robin Egg blue undertones. 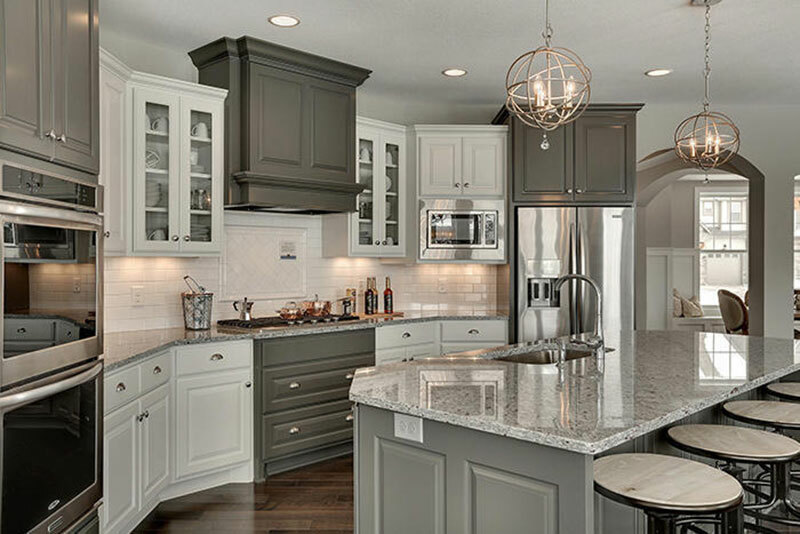 White Ornamental Granite – sometimes referred to as just Ornamental – is one of those Brazilian granites that has variation qualities that are all in the same tones – generally taupe and tans. This makes it ideal for monotone or sophisticated design. Accent it with contrasting cabinet colors or pops of color in accessories. 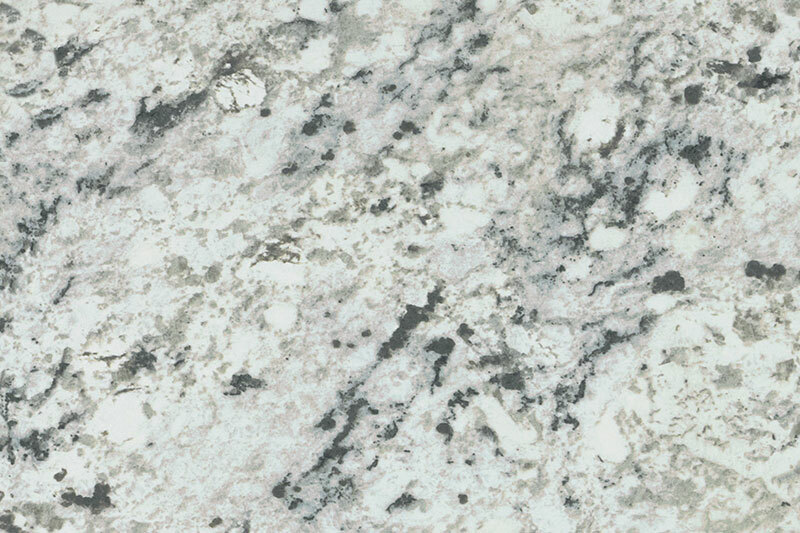 Andromeda White Granite has a creamy-white background from Sri Lanka. Cloud type grey veins are peppered with mahogany-onyx spatters. Because of the predominance of the softened background, it works well with white, cream, tan, dark brown and reddish toned cabinets. Not only does it work well with contemporary styling, it is especially nice with French Country and American Craftsman styles as well. 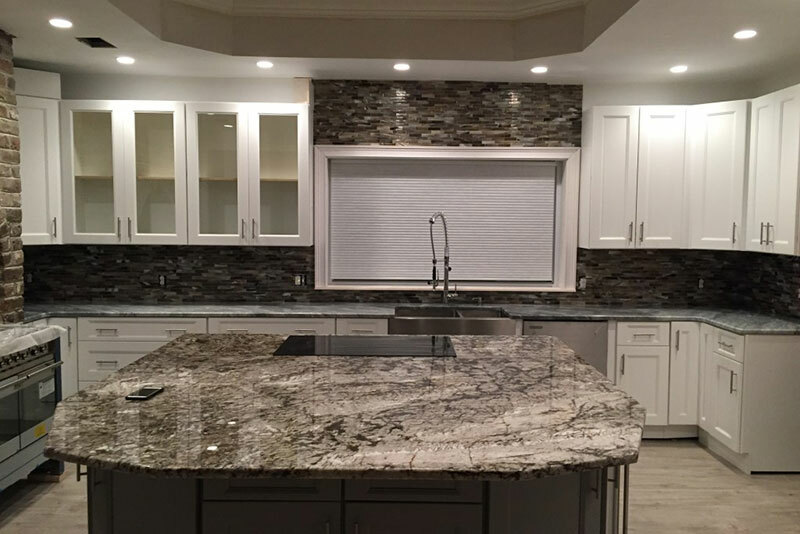 Supreme White Granite can be very elegant with large areas of striations, swirls and pooling eddies or can be a dark white freckled all over with grays and browns and hints of yellow. Mined in northern India this is the granite that you would typically see in fountains and monuments. labs are available in 2 cm that are suitable for backsplashes and walls or in 3 cm for countertops and floors. White Wave Granite from Brazil is a dark white background with patterns of large whirls that give the overall impression of waves ebbing on the beach. 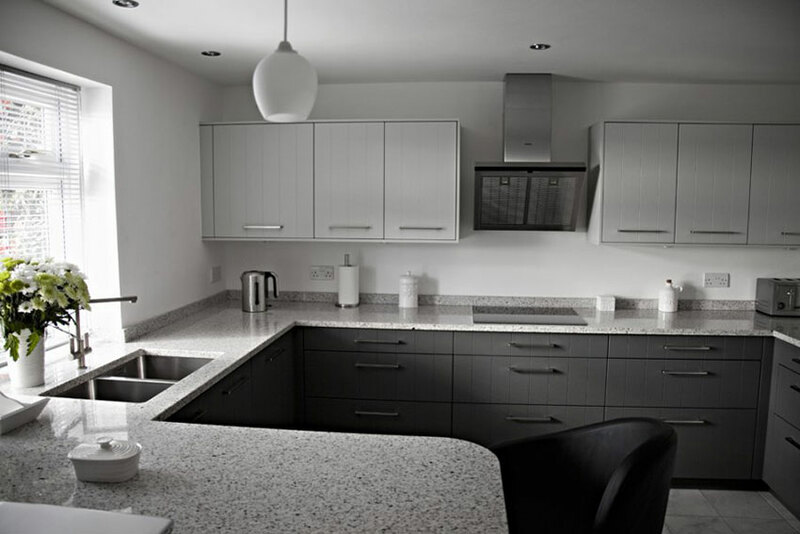 White Tiger Granite comes from Thailand – the land symbolized by the Tiger. The stone has two main patterns; one is where the markings remind one of a tiger’s skin. The other looks more like the paw tracks left in sandy soil on a Thai beach. Valley White Granite is one of the marble mimics that provides the sense of luxury without the upkeep and maintenance of the real stuff. Because the markings are long and separated, this works well in any traditional, classic or country home. 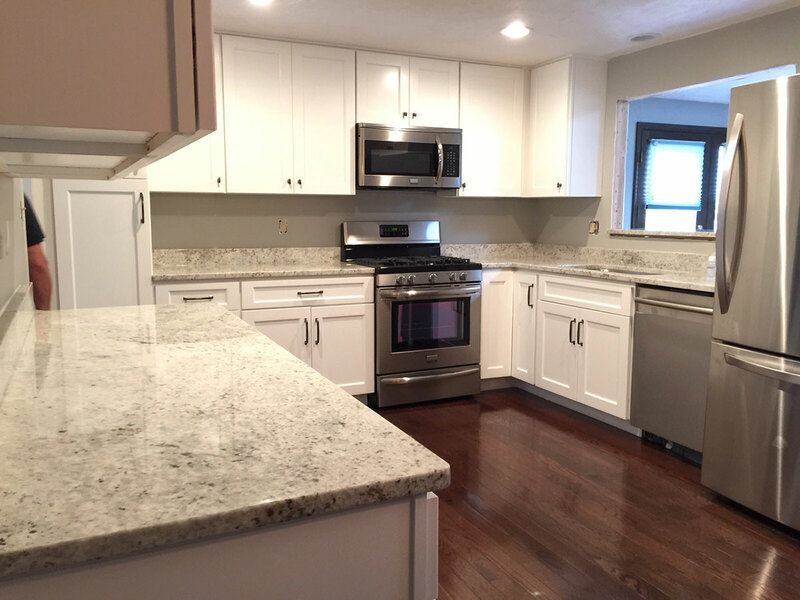 Bethel White Granite is quarried in Bethel, Vermont – U.S.A. – and has a reputation for being the finest substitute for the look of marble. It looks enough like Carrera marble that the La Grande Arche de la Défense in Paris is being refaced with this granite after the Carrera fell off the side of the arch and a spire in Abu Dhabi was recently finished in this granite. 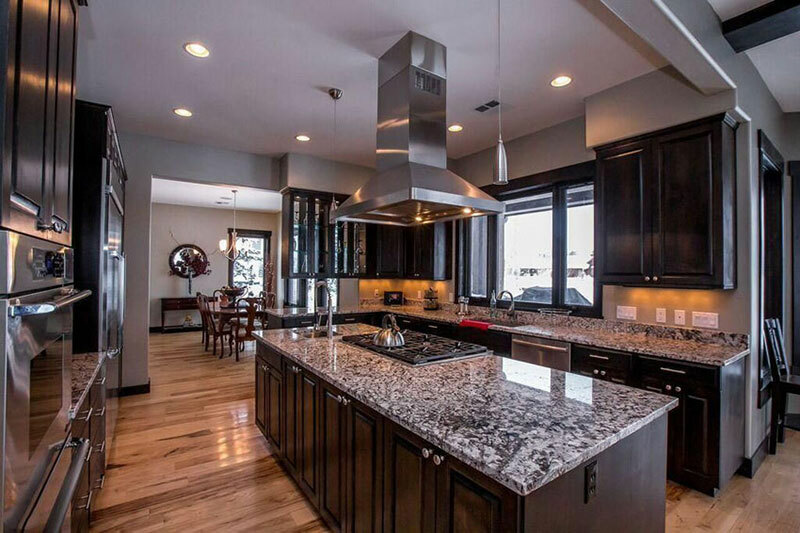 How Much Does Granite Countertops Cost? For DIY installation, slab granite prices start around $50 per square foot and go up as high as $200 per square foot while granite tile prices run as cheap as $10 per square foot to $80 on the top end. Prices are based on the clarity of the color, treatment or non-treatment, size and thickness. The thinner the slice, the cheaper the price and the less durable it is for kitchen use. The average thickness of granite is either 2 or 3cm and generally the longest slab is between 8 and 10 feet. These prices are for unsealed, unfinished stone and you can expect to add more to the cost if you want the granite sealed, have a specialty cut or rounded edges, or special finish – such as a leather, honed or polished. For professional tile and stone mason installation, the cost will jump about $100 – $250 for slab and $50 – $75 for tile depending on how difficult the cutting process is. 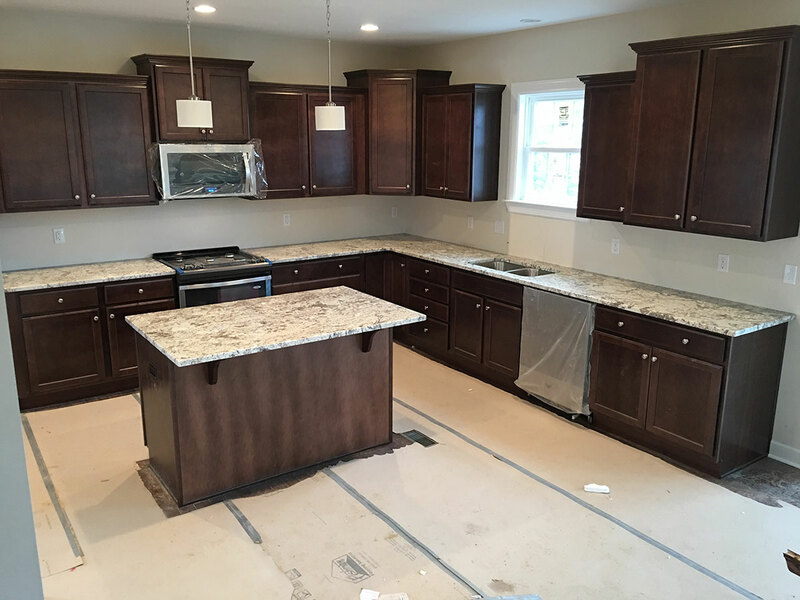 How to Install Granite Countertops? The Easy way is to hire a pro to do it. The Hard Way is to do it yourself. There are some people that like to get their hands dirty and dive into a remodel project headfirst. 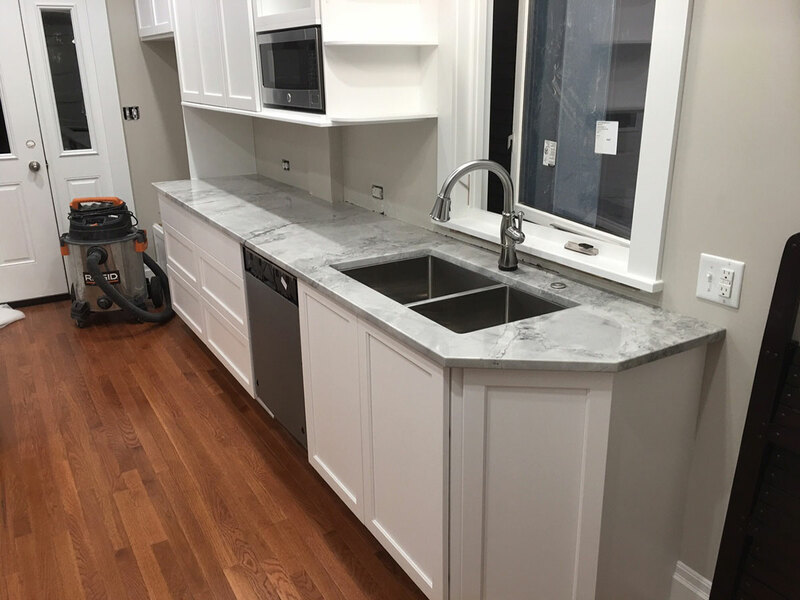 That said, when it comes to installing a granite countertop, it’s usually more cost-effective to have a professional handle it from start to finish. 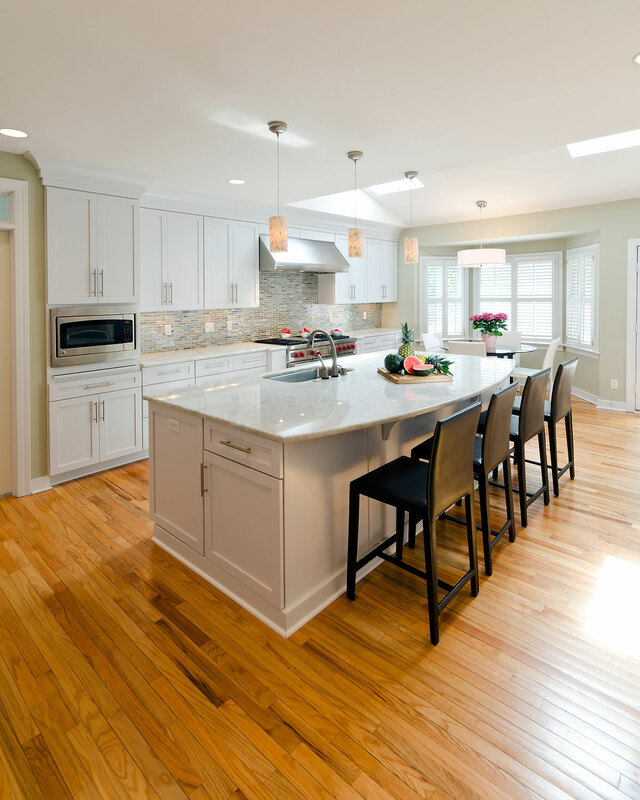 If you’re a DIYer, installing your own kitchen countertop could be one way to save money. However, you should be warned that cutting any slab of stone even with the right equipment – especially granite – one of the hardest stones ever – is difficult, if not impossible the first few times. If you cut granite in the wrong way or don’t have the proper support for it as you’re cutting it, it has a nasty habit of cracking, chipping or breaking. An average size slab is about 8’ x 8’. Let’s say you’re paying $125 per square foot. A single slab of granite is going to run about $8,000. Don’t blame the stone or the saw. This happens because granite has teeny-tiny holes randomly spread throughout the surface, which makes some areas slightly weaker than other areas. Since no one can see where the pores are or how deep they may be, you have to handle any natural stone as fragile. 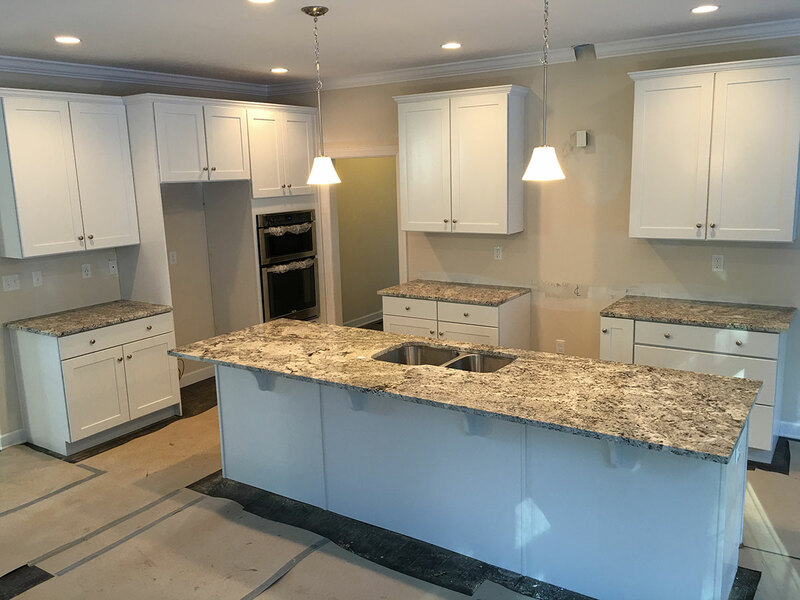 And, all White Granite is more fragile than other colors and will need to be kept sealed or you’ll have staining issues that can’t be removed. You might want to find a local stone fabricator in your local area before you buy the slab. Have him/her come out and measure the actual area personally. 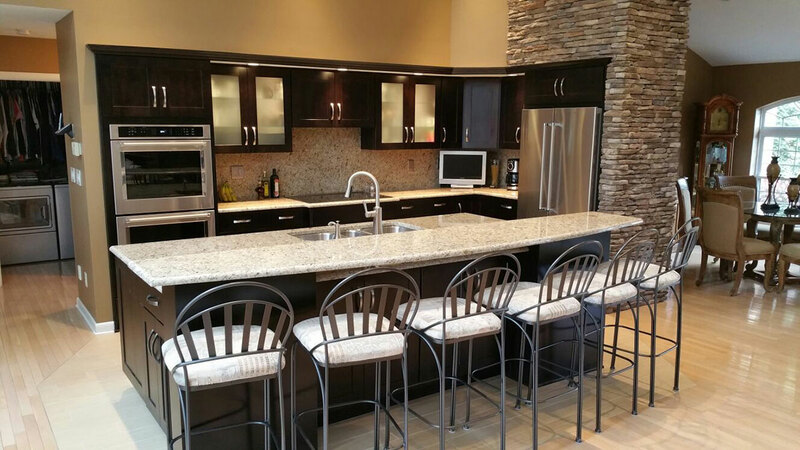 Some home stores are now offering prefab kitchen countertops in granites but if you have your own design. A lot of homeowners make the mistake of taking measurements for the countertops before the old one is removed. You’ll never get an accurate measurement if you do that. So, once they’re off the cabinets, grab a measuring tape, pencil and paper. You’ll need to measure from the wall to the front face frame – the support on the front of the cabinets. Because buildings are not square and cabinets may have been adjusted slightly from one to the next, you need to measure every 18” along the whole length of the countertop. Then, measure the length of the countertop you want to install – adding a few inches if you want overage or a waterfall effect. THEN, Measure the whole thing again! You’d be surprised how many professionals get the wrong numbers by 1/16th of an inch in the first measurement. If you get different numbers, measure again until you get numbers that match. Yes, it’s a pain but it is better to have a slab of granite that doesn’t fit properly! You’ll only need to do this if your stone fabricator doesn’t come out and see the project- which happens more than you’d imagine. Using freezer paper or newsprint paper and your measurements, draw the countertop and cut it out. Now lay the template on top of your cabinets and make sure it’s accurate. Once that’s perfect, using either Mylar (the best option) or thin, Luan plywood, transfer the final paper template onto it and cut it out. Remember, a saw blade is 1/8th of an inch. You need to cut on the outside edge of the lines or you’re model will be off by that much. Cover the base cabinets with cardboard so you can place your level in the center of each section. Make absolutely certain that the base cabinets are level for the entire length. If any one section is out of level, you’ll need to add wooden shims to correct it. Unless you’ve arranged with your fabricator to deliver the cut granite, you’re going to have to find a way to drag your trophy home. A 2’ x 6’ slab of cut granite weighs approximately 400 – 425 pounds. This is not a one-man job. Granite is fragile and has to be handled with care – bring padded moving blankets, cover the entire stone and protect the stone from chipping. Use adjustable straps wrapped around the entire slab – the short way – and carry the granite by the straps if you don’t have a mechanic’s dolly. Add additional blankets to the sidewalls of the truck or van that you’ll use to drive your prize home. Make sure that you have a safe place in the home to set your countertops down if you aren’t ready to install them as soon as you get it home. There are multiple steps to this and you’ll definitely need several guys for this process. Choose helpers that don’t have a tendency to bump into things since you’ll be moving the cut piece a couple of times. 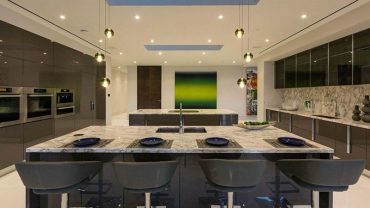 ** Maintaining your granite countertops is an ongoing project but not nearly as formidable as keeping marble in good shape. 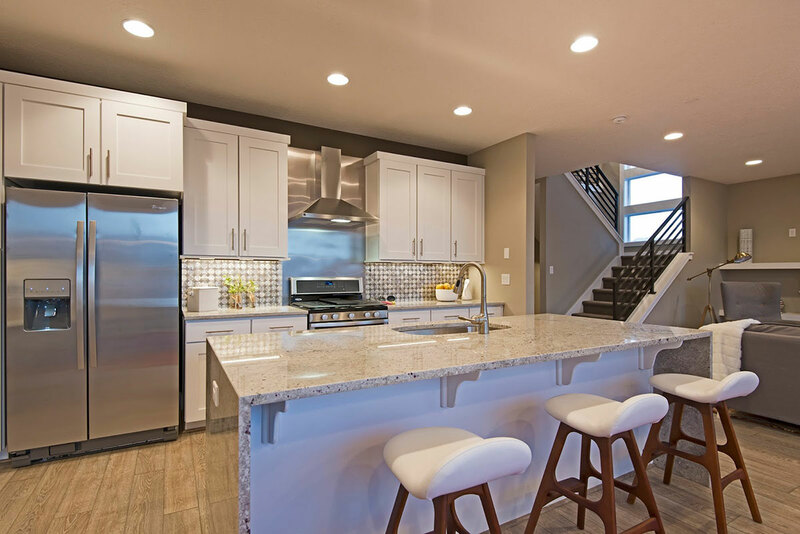 White granite countertops are the best option as a first step to creating the kitchen that you want to live with for the next twenty or thirty years. Stone never goes out of style and white always goes with everything.